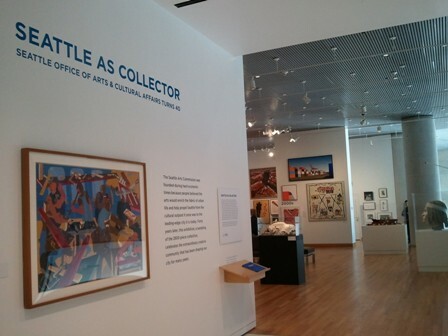 I had the pleasure of attending the opening for the Office of Arts and Cultural Affairs Seattle as Collector exhibition here at SAM last night. The exhibition is part of the celebration of the Office’s 40th Anniversary, and the show includes over 110 pieces from the city’s 2,800 piece collection. The city’s collection, garnered through the 1% for art program, is really pretty extraordinary. I had been looking forward to seeing the installation, but when I actually walked through it, I was really struck by the artists included. 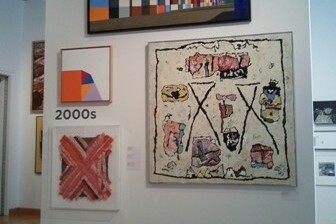 We’re talking Chuck Close, Jacob Lawrence, Gwendolyn Knight, Alden Mason…big names. And there were a bunch of artists that I recognized because of exhibitions and projects I’ve worked on at SAM over the last few years. 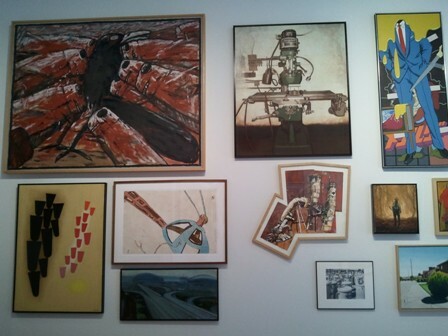 On one wall, there’s a Gaylen Hansen (the upper left, with the crow and cockroaches) reminding me of how much I loved this show we did in late 2007, in close context with a Michael Brophy (the small square one in the middle on the right side). Brophy is also featured in our upcoming Reclaimed exhibition, and seeing this work makes me really excited to see the piece we’ll be showing this summer. The Alden Mason on this wall compliments the currently open Alden Mason exhibition up on the 3rd floor – you should run up and see for yourself, but this is a very interesting addition to the varied works in that installation. And this Scott Fife brings back fond memories of the campaign we ran for the Kurt exhibition last summer (I feel like I’m seeing Fife heads everywhere lately – there’s one on the cover of the latest Pratt catalogue as well!). 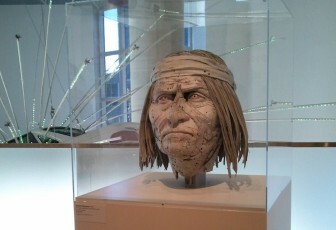 His work is so evocative and unlike anything I’ve seen before. If you didn’t get a chance to see his piece in the Kurt show, swing by if only to look at this one. 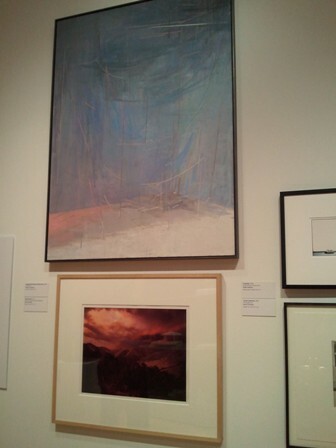 Farther down the hall you encounter a Margie Livingston hanging above a Glenn Rudolph. Livingston was the SAM Betty Bowen Award Winner in 2006, and Glenn Rudolph had one of the first installations at the Olympic Sculpture Park when it opened in 2007. And right next to both of those pieces is a beautiful set of photographs by Spike Mafford, who SAM worked with at the opening of the SAM Downtown Expansion. Those are just a handful of the pieces on view. I hope you can take some time to come visit this amazing installation at SAM over the next few months, open through October 23 of this year. The art is hung densely, salon style, so prepare to sit down and take it all in. It’s in SAM’s free area, so there should be nothing to stop you!